BEYOND BUCKSKIN: Video | BBBxGON Fashion Flash Glow Party! Video | BBBxGON Fashion Flash Glow Party! 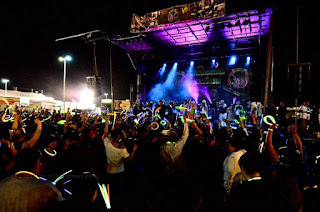 In March, Beyond Buckskin was approached by Emergence Productions to help put on a "Fashion Flash" segment during their Stage 49 DJ Glow Dance Party during the Gathering of Nations powwow in Albuquerque, April 2013. The show included BBB-affiliated designers and models, and featured designs by The Soft Museum, Kevin Duncan (Apache/Mandan/Hidatsa/Arikara), Sun Rose Iron Shell (Sicangu/Oglala Lakota), and JT Willie (Navajo). Click below to see a video of the Fashion Flash Glow Party and to read comments by the folks behind Emergence Productions. Melissa and Shkeme (owners and producers of Emergence Productions) stated, "This is the 2nd Annual DJ Glow Dance Party with music by Tabletop Sound and hosted by Ramonski Luv of Chicago's V103. Emergence Productions are the entertainment coordinators for Gathering of Nations, Ltd. and this year, because we've been observing for sometime now, all the upcoming great fashion designers and models, Emergence wanted to include this element in the DJ Glow Dance Party which we named "Fashion Flash". We were then referred to Jessica R. Metcalfe of Beyond Buckskin by Designer Sun Rose Iron Shell and EP Intern Juanita Toledo. Jessica (who is super awesome) organized the designers and delegated Autumn Dawn of The Soft Museum to be onsite coordinator (who was fun, easy to work with - well done Autumn!) The party was bigger than last year and a MAJOR BIG UPS and THANKS to the Gathering of Nations Powwow directors who are also the producers and founders of Stage 49 and who generously provided all the glow gear thrown to the audience; glow necklaces, caps, glasses, beach balls, whistles. The DJ GD FF party was 90 minutes, crazy fun and took a lot of team work right down to some of the models helping us get the glow gear lit, random friends' moms helped, and one of the funniest "go team" memories was all of the Native Roots band on the side stage platform helping us get the rest of the glow gear blown up, lit and thrown! Total time to get all the glow gear ready was about 2 hours. Additional Special acknowledgements and appreciation to Table Top Sound DJ's, Native Roots , Emergence Productions Event Staff, the pumped up audience, impromptu "get down" spotlight dancers, designers who were responsible for bringing the models ready to walk in their garments, make up and hair, their stylists, the models who strutted, smiled and danced and the "totally lost their minds having fun" AUDIENCE! For EP, all the outstanding talent inspires us to keep creating and producing year round, we hope to make 2014 even bigger and better and also to see similar events created throughout our indigenous events!" It sounds so great! Thank you for updating!